July 23, 2007. For immediate release. Images attached. Opening Reception: First Friday, August 3, 6-8 p.m.
A Magical Place . . . of seeds and inks and fibers . . . suspended woodfired clay forms . . . found objects nesting in handmade paper boxes . . . Oaxacan sand and earth pigments . . baskets made on Bainbridge Island of Zimbabwean papers . . . an exchange of ideas from several disciplines, creating artwork that reads like haiku and resonates with the voices of ancient peoples. Barbara Campbell, Corvallis, Oregon. Barbara is a self-taught potter, artist, and teacher with a degree in Anthropology from Oregon State University who has long produced functional pottery, recognizable for its unique brand of whimsy. Among her many accomplishments, she has taught ceramic handbuilding techniques as a Visiting Artist at the University of Oregon; and at Juniata College in Huntington, Pennsylvania, in a residency hosted by well-known woodfire potter Jack Troy. Based largely on her anthropology background and her connection to the art community of Oaxaca, Mexico, Barb has recently begun an exploration of materials other than clay, and the joys and burdens of collaborative art � the ability to step away from the �I�, to participate in the flow of ideas and possibilities presented in a collaborative setting. Barb has exhibited widely in Oregon and Washington as a ceramist and is regularly featured at The Island Gallery. In this exhibition her paper works - collages and triptychs bursting with the vitality and earthiness of Oaxaca - take center stage. Javier Cervantes, Oaxaca, Mexico. Born in Mexico City in 1953, Javier spent many hours as a young boy visiting the National Museum of Anthropology. There he would gaze at room after room of Pre-Columbian artifacts, at the varied faces, figures and sculptures � eventually understanding that he was in the presence of the work of his ancestors. Javier went on to study ceramics and art in university, but found that the fascination instilled in him as a child relentlessly informed his adult work. 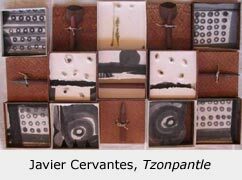 In his ongoing study of form, color, style and materials, Javier makes objects that can be utilized, but are more often intended to touch the ritual or spiritual inclination of the viewer. He works in paper, stone, wood and clay, filling this exhibition with free-standing sculptures, murals, and box forms that invite the viewer to interpret the ancient poetry in each one, and as they relate to one another. Katherine Michaels, Bainbridge Island, Washington. 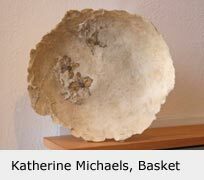 Katherine began her art career as a bronze sculptor, casting pieces in her own foundry. 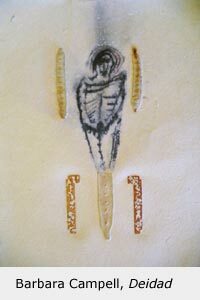 She now works exclusively with paper, beeswax and natural objects. In this exhibition, she offers baskets she has sculpted from paper and natural fibers produced by Mapepa, a Zimbabwean woman�s cooperative. The cooperative uses non-forest inputs in the production of ecological handmade paper. Katherine contributes a percentage of all of her sales to this organization.